built in the branches an ancient Banyan tree. 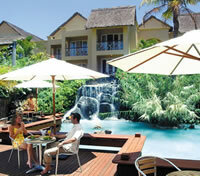 It is an ideal place for family holidays with plenty of entertainment for adults and children alike. makes it a popular choice with the fun-loving fraternity. 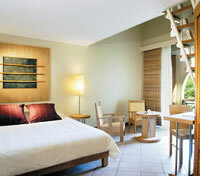 The rooms either have lovely sea views or look over the lush tropical gardens. The interior décor is designed to the highest modern standards featuring many space saving innovations in the bedrooms and bathrooms. and is valid from time of arrival until time of departure. 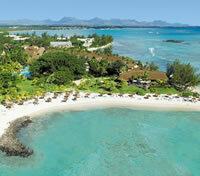 Inclusions for groups differ on all inclusive offers. Beachcomber offers a wide choice of entertainment. 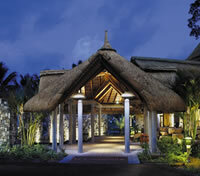 The dedicated leisure and entertainment team ensures that there is always something of interest happening at the hotel. Every guest is free to take part, whether actively or as a spectator. A weekly entertainment programme is available for all residents and is posted in the public areas of the resort. entertainment is rich and varied, from themed evenings and live bands to musical and cabaret shows. 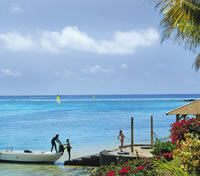 Typical Creole evenings are a weekly feature not to be missed. There's something for all tastes. Take your time and enjoy … the choice is yours. 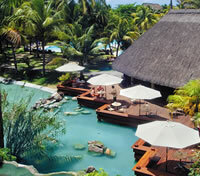 Unique to the island of Mauritius, Le Canonnier has built a Wellness Centre in the sturdy branches of a Banyan Tree. 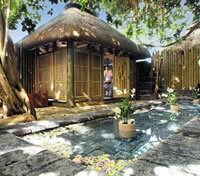 Access to the rustic massage rooms is stone steps leading into the tree. Professional therapists offer a variety of treatments. There is a strong emphasis on therapies originating in the East and therapists are expertly trained to administer the most soothing massages using these popular methods. Treatments include hot stone therapy, reflexology, and a variety of scrub and wrap treatments.